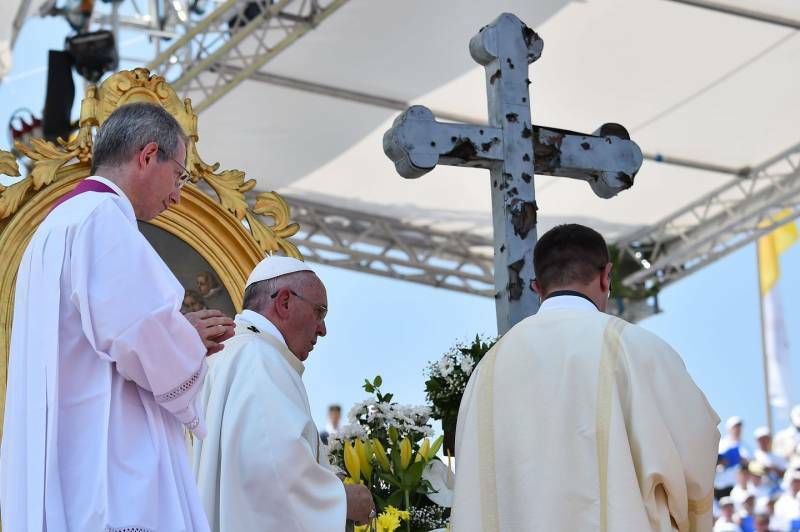 The trip to Sarajevo has perhaps clarified this particular aspect of Pope Francis’ choices. In St. John Paul II’s view, Sarajevo was the Jerusalem of Europe, the place where all religions met together. Still today behind the Catholic cathedral there is a mosque and next to it the Orthodox cathedral, while on the other side is a small synagogue. It is true that for many years these religions lived together in peace, as everyone says. The area of the former Yugoslavia has been living a constant war since the 14th century when the Turks conquered the territory, after which it passed from one hand to another. There has been a continual conflict in the area for centuries, incapable of fostering identities strong enough to live together peacefully, able to build up identities that refuse to subject the others to themselves. After that, fifty years of “Communist acid rain” finished off the job. Under the veneer of a universal fraternity, while continually eroding man’s humanity and thus taking away respect for human dignity that until then had been maintained despite wars of conquest and dominion, Communism blasted hearts apart. The 1992-1995 war was a natural consequence of this deterioration of the human spirit. It was a different war from any other, a war of annihilation. As a system, nihilism leads men to treat other men as non-humans. The stories of tortures told by survivors tell us about the total inhumanity and contempt for the human being. This theme echoes Pope Francis’ other trip on the European continent. As with this recent one, the Pope’s first trip also lasted only one day, and it, too, was to a Slavic country, Albania. Francis went there to back the interreligious dialogue that flourishes within a society which has recently discovered liberty. In Albania, too, a Communist regime had ruled for 50 years, and during this regime all religions were persecuted. Man had to speak for himself, without God. Soldiers practiced torture and killed people in unimaginable ways (a woman was enclosed in a sack with a wild cat, and forced to remain there while the soldiers molested the cat with a crowbar). In fact, they simply did not consider the person in front of them as a human being. This is how believers of all religions in these countries have shared in the same destiny. During the papal visit to Sarajevo, in a private meeting with some survivors of the prison camps during the war (the meeting was organized by the local Caritas agency), a Croatian, a Serbian and a Bosnian were sitting together at the same table and gave the Pope the same kind of testimony. They had experiences in common, and yet they were involved in a common path that went beyond hate. But the Albanian experience is not the Bosnian experience. War is dramatically evident everywhere in Sarajevo. Everything is a war memorial. Nevertheless, when people talk about war, they talk about the same problems recurring. The Dayton Accords crystallized reality; Bosnia is de facto divided into two independent territories. Three presidents are elected for a 4-year tenure and chair the presidency in turns, an arrangement that recalls the ethnic division which mirrors the religious one. In Bosnia Herzegovina, the situation has not yet deteriorated into war, but neither has it returned to what was there was before the war. Meanwhile, in Albania a development of sorts took place following the Communist years, and this was evident in the major interreligious dialogue that has flourished. Pope Francis was moved by this dialogue, and he declared Albania a model for Europe. Now the question is whether he can turn Bosnia Herzegovina into a reprimand aimed at Europe? These two Balkan trips of Pope Francis are thus connected with his visit to the European Parliament on November 25, 2014. The Pope went directly into the heart of the European institutions; no other State was to be included in the visit, as the Pope wanted to address directly the entire European population. He made this decision because it is in Europe that secularizing trends are at work, and he thinks it necessary to intervene before the human being is reduced to the status of an object, and Europe becomes the ground of an another war of annihilation. During this European trip last November, Francis did not schedule a single moment for public prayer, thereby crediting the theory of radical observers that the Pope is “one head of State among many other heads of State.” This lack of a proper context – the Pope, in fact, has a diplomatic role because of his spiritual importance – created the basis for an intentional distortion of the Pope’s message. 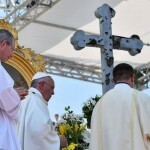 European secularists used this lack of proper context for the Pope’s visit in order to cut from the summaries of all his speeches those passages in which he spoke of life issues, or in which he defended the traditional family and appealed to the common transcendence of the human being. In fact, the issue is really this last point: the common transcendence that acknowledges that all are children of God. It is the main issue in Albania, where interreligious dialogue is profoundly grounded on a common notion of the human being who is capable of integral human development. It is the main issue for European institutions, where abortions, euthanasia and in-vitro fertilizations are accepted, legalized and financed without taking in consideration the particular sensitivity of people on these issues, as well as the human being and his dignity in itself. It is the main issue in Sarajevo, where this concept is needed so that society can appreciate the common roots of human beings and take history a step forward by moving beyond conflict. Everyone in Sarajevo expected the Pope’s push for this new step forward in history. They did not want a vague appeal to the culture of the encounter. This is the moment when the diplomacy of the Holy See must regain traction and handle even delicate situations such as Bosnia Herzegovina. For Vatican diplomacy, it is now time to move beyond the notion of a diplomacy aimed merely at achieving an immediate political goal, and to return to a diplomacy grounded in truth. Even missionaries believe that this is needed. During this past week in Rome, the general assembly of the Pontifical Missionary Societies took place, and Cardinal Fernando Filoni, Prefect of the Congregation for the Evangelization of Peoples, underscored the contribution missionary work makes to nunciatures – the Pope’s embassies. Missionaries make this contribution because they acknowledge that the institution gains them the freedom to move within political territories without being dominated by any public institution, to evangelize toward the common good, to heal the wounds of war by promoting the path of truth and reconciliation, to help people to achieve their integral human development. If within the Church, Pope Francis’ real enemy is ecclesiastic careerism, the real enemy of the Church is not in the end secularism, but specifically the nihilism that reduces the human being to an object worthy of annihilation by other human beings. This is the reason why speaking about God in doctrinal terms is a must today as it ever was, in spite of the more missionary thrust of Pope Francis’ pontificate. Speaking about God is important within the Church’s ranks in order to understand what kind of Church is needed today, and therefore which reforms today’s Church really needs. Speaking about God to the people of today is also necessary so that they do not fall into nihilism. In this sense, Sarajevo is a rebuke to Europe. Perhaps, this is the reason why the Pope chose it as his second European destination. Speaking of God. There is a fair amount of talk about God. There is a wide body of allusions to God, but I rarely hear, anymore, from ecclesiastics about the Most Holy Trinity, Father, Son and Holy Spirit. I can’t think of the last time I heard any of them declare with boldness the Divinity of Our Lord, Jesus Christ, who, from all appearances has quietly been reduced to a Jewish wisdom figure whose musings can be profitably reflected upon to uphold and affirm any coochy-coo commodity that will make people feel good and affirmed. Kind of like a “plush doll” for adults “of a sort.” Is this pontificate good for anything? If there is a real concern about careerism, we might look to those who have done so well in the last two and a quarter years and cut them down to size.